Has anyone tried painting their yurt panels white? I would hate to be the guy that mooped up the playa with paint flakes after a dust storm. So, any tips on paint selection or sealant would be appreciated. After I'd explained my new yurt design at a conference a while back, a physicist friend of mine came up to me and said "I'll never understand why everyone goes with aluminum-coated panels -- it's such a bad idea". He explained that aluminum is optically gray (not an especially high albedo, especially when dusty), but white in IR. Meaning, it absorbs visible light, heats up, and can't reradiate the heat effectively. So the heat is conducted into the panels. By contrast, observatories are painted with a white paint which, while it also absorbs some visible light, reradiates it all in IR very effectively. So, the dome doesn't heat up. Yeah I did that on my first yurt, the first year I went. Thought it would be good to paint it white so it wouldn’t be so glaring. So painted it with some paint I already had, indoor water based acrlyic, about 1 day before we left. OK thanks. Any moop issues? My yurt assembles with velcro, so tape is not an issue. Can you recommend a spray paint? No I was ok on the moop, no issues. Elastomeric roof coating is designed exactly for what you are doing. Elastomers stay flexible when dry so do not flake or peel. Yeah but does it come in groovy colors? You have to look at the reflectivity, absorption and emissivity. Those numbers are not the numbers of typical white paint nor of the aluminum foil on the typical hexayurt panels (they absorb more and emit more than the article's numbers). The better the reflectivity, the more time you have in the sun before that heat builds up. Both the foil radiant barrier and the insulation work hand-in-hand. ALL practical surfaces have some absorption and that heat collects up; then it faces the insulation to try and conduct inside. Typical white paint absorbs significantly more than the number in that article. While better than most white paints, white Elastomeric roof coating play funny in their specs by bouncing selectively between values for visible vs. IR. It works well on my trailer, but it's NOT a miracle radiant barrier by any means. 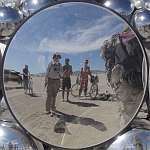 AND, on the playa you're not just looking to reflect away direct solar radiation, you're trying to reflect away the heat radiated at you from the hot air and the sun-baked ground. Which is why radiant barriers work so well on the playa. Observatories have the advantage of being up and typically at the top of a geographic feature. If you're going white, then gloss white reflects more. And if you mist the paint onto the surface, like overspray, so it has a slightly pebbled surface for more effective surface area, then it has more surface area from which to emit heat away. And a textured white surface that is emitting has more of that emitted energy reflecting away. A media-blasted (for more effective surface area) aluminum surface misted with a gloss ceramic white paint makes an awesome radiator for getting rid of heat when in the sun. It comes in all colors all the time. White! That's a couch of nope that probably needed burning. If you stick with the shiny (they're only relatively shiny, not mirror) panels, it is a good idea to take a spraycan or two of white. That way if you're camped beside someone and your shiny panels are reflecting too much heat at them and baking them, you can give a quick light mist on the offending panels to spare your neighbours.